Located in the heart of Mid Wales, Morgans Family Butchers have a long history of providing traditional, top quality meat products & condiments, from their two shops situated in Brecon & Builth Wells. We are a well established, family fun business specialising in traditional butchery methods that will ensure top quality products to you our customers. With the vast majority of products sourced direct from the family farm customers can be sure that they are buying into the true taste of Wales, straight from the farmers gate. 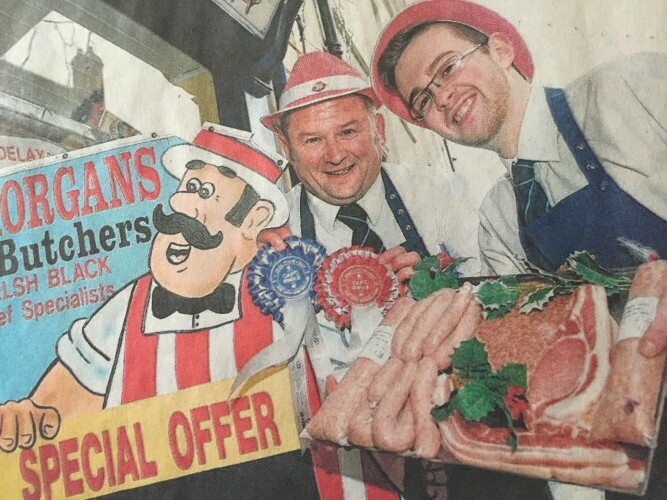 Morgans Family Butchers was founded in 1999, to run alongside the family live stock purchasing and farming enterprises. Originally based in Brecon, the second premises opened it's doors in Builth Wells in 2001. In 2009 under the High Meadows welsh beef and lamb banner the business expanded into the London Farmers Market world trading at the Alexandra Palace on the second and fourth Sundays of every month throughout the year. Over the years we have won many industry awards. Most recently in 2014 our products won a total of nine gold awards. Four of which were for our bacon - home cured, dry cured, farmhouse cured and sweet cured; one for a beef burger with caramelised onion and four for our sausages; plain farmhouse sausage, pork, leek and ginger sausage, pork and leek sausage and a Christmas festive sausage which consists of pork, apple, herb and cranberry.